New Features of MAVisto. For further details please look at the tutorial site. The coverage of network elements by motif matches is highlighted by using a color scale or a gray scale. This allows a visual exploration of the distribution of the matches within the analysed network. • Highlighting of network covering of motif label derivatives. Now it is possible for motif label derivatives (see next point) to highlight the networks elements which are covered by their matches. Therefore, it is possible to analyse which parts/elements of the network are affected by the matches of a motif label derivative and which parts/elements are not affected. • Analysis of networks with labelled edges and/or vertices (colored networks). For each motif all different label derivatives can be analysed. Motif label derivatives belong to the same topological motif but differ in the labels of their edges, in the labels of their vertices or both, in the labels of their edges and vertices. These three different types of analyses can be performed with MAVisto by considering only edge labels, only vertex labels or both, edge and vertex labels. The number of different edge labels or vertex labels of a network is not restricted. • Coloring of the edge types of a network. The different edge types (identified by their label) can be highlighted with different colors to obtain a better overview of the distribution of the edge types within the analysed network. • Exclusion of particular edges from randomization. 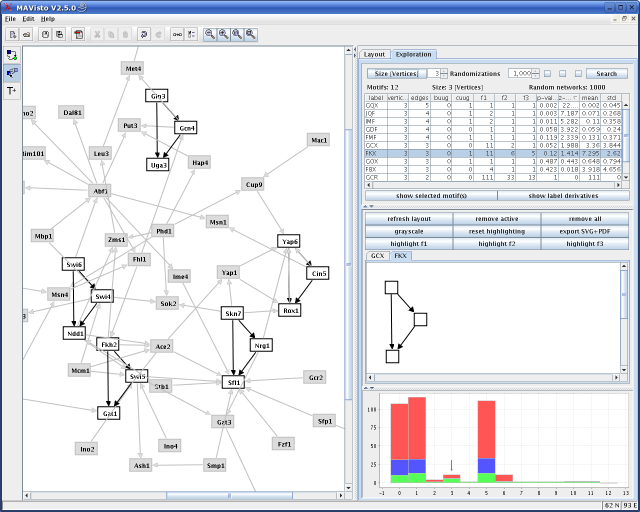 The labels of the edges of the analysed network are used to arrange the edges into particular groups of edge types according to their edge label. It is possible to exclude the edges of certain edge types from the network randomization process in order to allow for example for a discrimination of regulatory edges and structural edge when analysing the statistical significance of motifs. The tool has been published as an Application Note in Bioinformatics, see below. The online version of the paper is available as an advanced access publication. A detailed description of the pattern search algorithm and the different frequency concepts can be found in the following publication: Towards Motif Detection in Networks: Frequency Concepts and Flexible Search. For a short tutorial showing the features of Mavisto please look at the MAVisto tutorial site. download Transcription regulation 62 93 Core component (largest connected component, loop free) of a transcriptional regulatory network of Saccharomyces cerevisae. The data were obtained from this site and were converted into the gml-format. download Transcription regulation 418 519 Transcriptional regulatory network of Escherichia coli. The data were obtained from this site (Version 1.1) and were converted into the gml-format. Contact Page last updated on December 4, 2007.